While Shuttle pioneered the Small Form Factor computer, some of Shuttle’s competitors have been making real efforts to stand out from the SFF crowd. Soltek is one of those companies, and we were pleased to take a look at their latest offering — the Qbic EQ3401M. 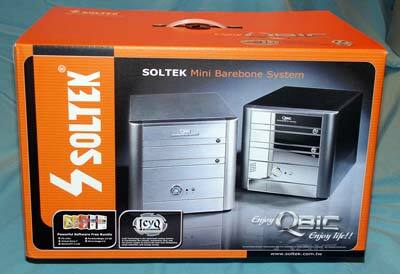 Soltek seems to have a thing with mirrored fronts, so they have extended this design from their earlier Qbic series. However, the big news with this new small Soltek is the expansion capability. Soltek managed to get two 5-1/4" bays in the EQ3401M, instead of the single 5-1/4" bay that we see on competitor’s systems. While the Soltek is about the same depth and width as the Biostar and Shuttle, you can see that the extra bay makes it a bit taller. As we take a closer look at Soltek’s new Qbic EQ3 series, we also found a number of other innovations. It is clear since our last look at Soltek in the March SFF Roundup that Soltek has listened to the comments about their SFF and made many improvements. The Soltek, like the Shuttle and Biostar we recently reviewed, is based on the latest Intel 800FSB Dual-Channel 865 chipset. The Qbic EQ3401M uses the onboard graphics of the G version of the 865, but also has an 8X AGP slot for graphics expansion. Soltek supports any current 800FSB C Series Intel processor, as well as earlier 533 and 400FSB socket 478 CPUs. Add to that 8 USB 2.0 ports, 3 Firewire, Serial ATA, a large 250Watt Power Supply (by SFF standards) and 5.1 audio, and you have the makings of a formidable SFF competitor. Does anyone know whether this would accomodate the upcoming Prescott? I have one that's been sitting around for months. I've been waiting for the new 90nm procs but wonder whether it'll be compatible. What do you lot think? 2 drives in the 5.25s, one in the floppy 3.5 and one normal drive bay. The raid card in the pci slot, a Radeon 9700 pro in the agp and a DVDRW/CDRW combo in an external case on the USB2. My only reservation is the power supply - I know for a fact that (using an extenal meter that measures power drain) my rig pulls 220W when running 3dmark2001 and copying 2 files simultaniously and the only real difference is an SB live and my p4 is a 2.4b. Im just not sure that even 250w will be enough. Apple introduced the Cube back in July 2000, if I recall correctly. But then again, the Next Cube came out long before that (Oct. 1988!). It was a fairly big cube, though. Of course, if you go really far back, things like the Sinclair were, um, small, too. Anyway, it seems like the Shuttle, Biostar and Soltek (that were recently reviewed) are all good PCs. Praising the Soltek for having more capacity is a little odd, though, since I thought the whole point is for these to be small. #9 what do you consider to be a sff? 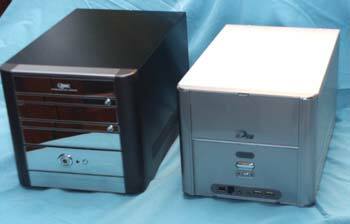 i remember some macs being very small(compared to hulking pc's at the time). while i cant say for a FACT that they were the 'first' to make a sff, i can say that i have seen similar sff-like-macs many, many years ago. btw, i am not #6, i am some other person.